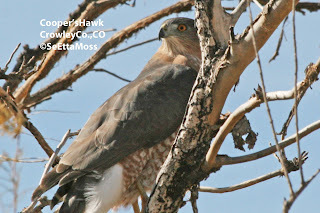 The top pic shows the brown markings on the lower belly, flanks and leg feathers. 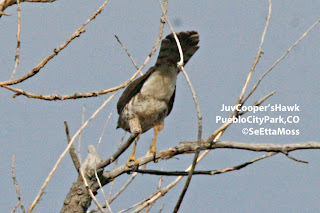 The middle pic gives a good view of the brown tail with wide black bands and some of the dark brown upperparts. 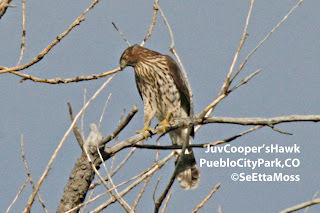 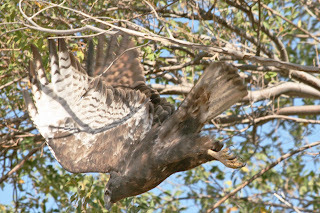 This juvenile Cooper's Hawk was looking for a bite, or two, to eat at the City Park pond in Pueblo, CO. Clearly different appearing from the adult Cooper's I posted earlier, this juvenile is an example of the 'heavily streaked type' described by Brian Wheeler in Raptors of Western North America which is "much more heavily densely and heavily streaked than on typical juveniles." 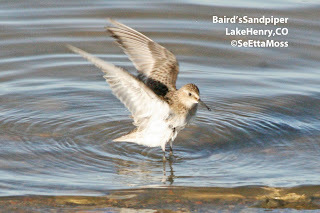 Field marks are shown in these pics including the large head (relative to the body), long tail (clearly very long on this bird), long tarsi (bare part of legs), tail feathers longest in center then proportionally shorter as they move to outside, tail pale gray banded with broad black bands with a broad white terminal band. 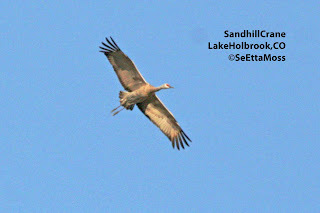 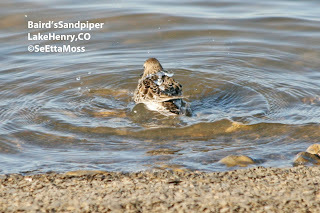 I drove down to the La Junta,CO area today and was rewarded both by a gorgeous Indian summer day and some enjoyable birding including flocks of Sandhill Cranes at Lake Holbrook that are stopping over on their migration south. 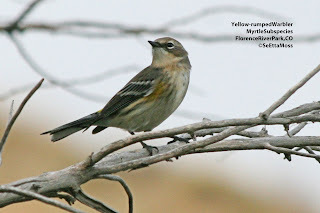 I found these little male Bushtits in a small flock in the same general area, in a dry wash, as the Williamson's Sapsuckers, near Canon City,CO.